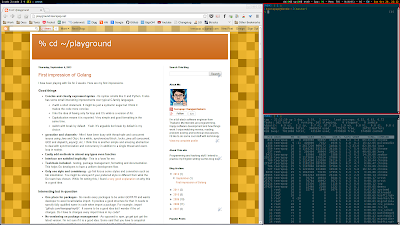 Last weekend I read about xmonad at Liang Zan's blog and I think I have never used tiling window manager. I was using GNOME Shell and it freezes sometimes. So I give xmonad a try as well as xmobar and urxvt. It took me more than a half day to set it up and get it working like I want and having the same functions as my previous gnome shell and its extensions. After a week with xmonad, I get used to it and still find-tune some configs everyday for little edge cases and new hotkeys. I think the overall experience is great especially if you are keyboard-centric. Every window actions are at your fingertips. It's fast, customizable and simple. Now, with xmonad, I can utilize my screen more effective. I haven't seen my wallpaper for a while. urxvt is also fast at startup, faster than gnome-terminal. The documentation and information on the internet is acceptable. You might need to dig in haskell syntax sometimes when your config errors. However, if you are a linux user, you are fine.